Do you have an American Revolutionary War patriot in your tree? Who are Ferro Monte Daughters? Members of the Ferro Monte Chapter are women a lot like you. Our common bond is our lineal descent from patriots of the American Revolution—any woman 18 years or older, regardless of race, religion or ethnic background, who can prove this lineage is eligible to join. For more information about memberership in this historic and vibrant organization check out Become a Member on the National Daughters of the American Revolution website. The Ferro Monte Chapter welcomes prospective members at our meetings and events. Check out our upcoming events; we look forward to meeting you. We will be pleased to assist you with the membership process and help you find ways to document your lineage. 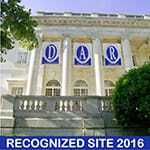 The Genealogical Research System (GRS) is a free resource provided by the DAR to aid genealogical research. Your DAR membership will keep your family’s legacy alive for generations to come. Our membership committee is here to help you navigate the research and application process. To get started, please consult How Do I Begin, fill out the pedigree chart, as best you can, and contact our Registrar.